So much so that I’ve taken to referring to her by pet names. There’s “my Sweetest” (a nod to our favorite Regina Spektor ballad I like to imitate poorly), “my New” (a classification, as she is my newest, best friend), “my Rodolfo” (Celest gave us both Tocca candles last Christmas. Mine was called “Positano,” hers “Rudolfo;” it stuck), and “my Date” (as the perennial singles of our Tribe we are frequently each other’s dates). Until now. Sara has moved away to Chicago for a few months. She packed her bags and her bike and hightailed it out of Bushwick for a change of scenery, a sense of adventure, to be close to her parents (and chef brother who cooks at Everest), and after wrapping the final edits on her first book, she needed time to reflect and decide what her next project will be. I’m just crossing my fingers that it includes moving back to New York. Soon. Erin and her “perfect” musician boyfriend still have each other; Celest and her On Again/Off Again have each other when they want one another, but I’m lonely without my Date. Last month, we all gathered for a picnic to send Sara off in style. At special events, Sara often gets asked to make a toast. People always want to hear what she has to say, and even though this celebratory bon voyage was in her honor, it was no different. She provided the entertainment. Sara had us in stitches as she regaled us with stories of her latest forays into the world of online dating and creepy wine directors. We laughed along, splayed out on the Great Lawn, clinking my Aunt Frances’ champagne glasses in full view of the park police. It was a boiling hot afternoon and my scooped watermelon stuffed with a salad of melon balls, cubed feta, fresh mint and Bing cherries, was welcome refreshment in the sun’s blaze. Our Brillant Savarin didn’t fair so well in the heat, but a bowl of grapes and berries, homemade chocolate chip cookies, and sandwiches Erin picked up from Whole Foods made our picnic, perfect. Of course, when the cops came, I stuffed the bottle of prosecco in Sara’s tote bag and quickly filled our glasses with Diet Coke from Erin’s. We were overlooked—no harm, no foul. Except that drinking cola at our lovely, gourmet picnic was, in and of itself, a crime. Carbonated corn syrup that passes for canned refreshment is, well, foodie sacrilege! I haven’t included quantities here as watermelon and picnic sizes vary greatly. Pick the melon needed to feed your crowd and then just adjust the quantities of the other ingredients to suit your tastes. Slice the watermelon in half horizontally. If you’re feeding a large crowd you can make 2 separate bowls of watermelon salad. If not, scoop the melon from both bowls and throw away one half of the melon. 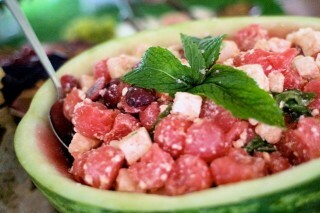 For salad, scoop balls of melon and cube feta, toss together with the halved cherries and lime juice. Top with fresh mint leaves and sprinkle in fleur de sel to taste. It’s past midnight. I’ve got the munchies, and I am totally craving your watermelon salad! Completely out of season, but a girl can dream can’t she? Hope you’re doing well Kimberely!